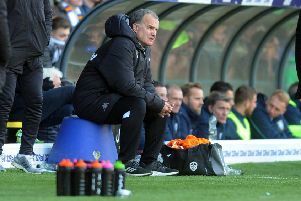 Leeds United boss Neil Redfearn has told his players they should be looking upwards now rather than worrying about the relegation scrap after their vital victory over Millwall on Saturday. The 1-0 win – courtesy of an Alex Mowatt free-kick that deflected in off a Millwall defender – lifted the Whites into their highest league position for some time as they moved up to the giddy heights of 12th place in the Championship. More importantly it took them eight points clear of the third from bottom Millwall and has finally put clear daylight between Leeds and the relegation places. Another potential six-pointer is just round the corner when United travel to play fourth from bottom Brighton next Tuesday so there is still work to be done before everyone can start breathing easily. There is also the little matter of a trip to play second-placed Middlesbrough this Saturday in a midday kick-off, but the Whites go into the back to back away games with spirit certainly renewed and confidence well on the way to being restored. Four wins from five games have done the job of reviving the club and a similar run in the next five matches would all but secure their place in the division for another year. That will be easier said than done with three of their next four opponents in the top five, but head coach Redfearn believes his team have settled into a good style. “There’s a lot of football to be played yet. But for the first time in a while we can start looking at sides above us. “We can try and make up some ground and get as much out of this season as we can. “What we’ve got to start doing is talking about the top half and getting further up the table. If we can keep this run going and string more wins together we’ll see how far we get. “The first 45 minutes (against Millwall) must have been tough for them. It was vintage Leeds United where you had 24,000 behind us with the team on the front foot. Leeds would have won by a bigger margin against Millwall had they not been denied two huge shouts for spot kicks again with one fan questioning whether the club was under a penalty ban rather than a transfer ban! Several chances also went begging and striker Steve Morison again failed to break his duck for the season despite finding himself in a number of promising positions. The rest of his game, however, is in great shape and he clearly has the backing of supporters who chanted his name throughout the 90 minutes last Saturday. Redfearn also backed Morison, saying: “I genuinely believe that he’ll score.